Erik Morales wasn’t even fighting for a title. Weighing two pounds above the allowed 140, the WBC Light Welterweight title was only for Danny Garcia to win. The 24 year old, winning his 23 fight (0 losses) since beginning his boxing career in 2007, just had more in the tank to withstand the aging legend, who must be contemplating retirement once again. It wasn’t a pretty fight, with both boxers not looking very accurate. Garcia landed 31% of his shots, Morales threw 200 less punches, with a 30% accuracy. He did tag Garcia a few times but looked clearly the older, slower man by the third round. By the sixth round, his legs could barely carry him around anymore. Even the mostly Mexican crowd couldn’t bring out a last burst of endurance and power. Garcia won by all the judges: 118-111, 117-110 and 116-112. Garcia could have probably gone for the KO, but probably showed too much respect for Morales, who came out of retirement in 2010. He won three fights before losing to Marcos Maidana, won the ring off of Pablo Cesar Cano in September. The glory didn’t last for long. For Garcia, it was a dream come true, although he isn’t considered one of the top juggernauts in the division. Maybe now people will be paying more attention to the Philadelphia native, coming from a Puerto Rican fmaily. He was in tears when speaking after the fight. It’s been a long way, everyone wants to be a champion,” Garcia said through tears in the ring after his victory. My dad stuck by my side and we did it. I knew it was going to be a bloody war. I couldn’t let him take my dreams away. 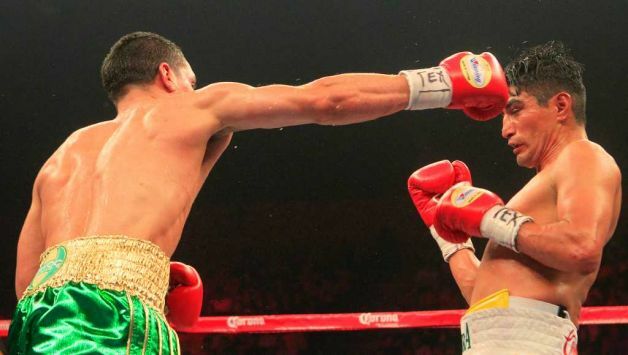 Morales did try and get the knockout late in the fight, knowing it was his only chance of winning. He did open a cut above Garcia’s eye and bloodied the younger man’s nose, but that was all he could do. Garcia sent Morales to the Canvas in the 11th round. The first Mexican to win a title in four different weight classes beat the count, but was couldn’t muster another effort. Garcia will be going wherever Golden Boy take him, and it also depends on the fluctuation of talent between Welterweight and Light Welterweight, and the outcome of the next fights for Bradley, Amir Khan and Lamont Peterson. Garcia, who’s been groomed for these kind of fights from the start, can only hope he’ll have a career similar to that of Morales. 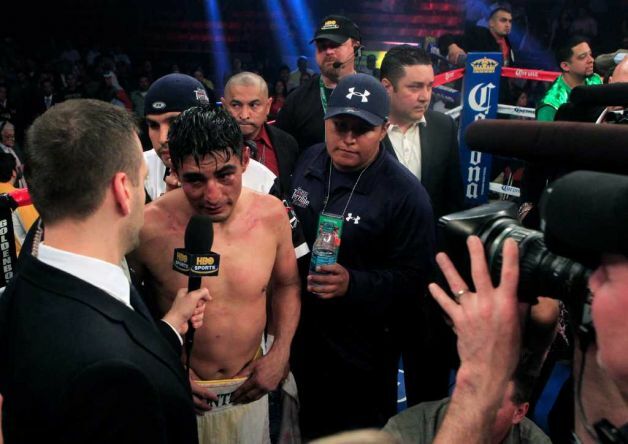 For Erik Morales, once again, it looks like the end of the line. Even he admitted he has some thinking to do – I have a lot of things to think about, I truly have to think about it. First of all, it’s my health, but I have to think about it. To take fights at this level against these types of opponents, it really affects my health. The last man to beat Manny Pacquiao didn’t have much left in him when returned, but it’s clear to everyone that his body can’t take this kind of punishment any longer, and he’s no real match for any of the top guns in the boxing world today.